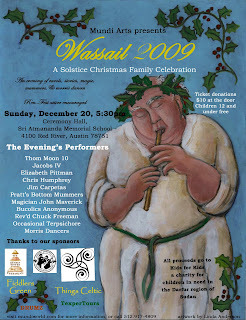 The official Wassail poster for MUNDI is now posted! The inspiration for the character on the poster was Jim Carpetas, the Father Christmas of the procession, who also plays the tin whistle for the house band, Bucolics Anonymous. I am also creating a backdrop for the stage this year, a snowy scene through a Gothic window. I may not be able to resist putting some fairies and elves peeking in...they will be discreet.